Leadership in action examines behaviors of leaders who lead. This space is reserved for those who walk the talk: a leader "in deed". It is one thing to read about them, but something quite remarkable to see them "live and in living color." One such leader is Christopher A. Masingill, former Federal Co-Chairman of the Delta Regional Authority. 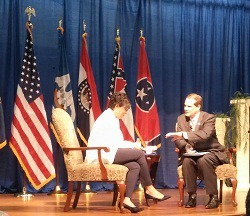 I had the pleasure of attending a Forum spearheaded by the White House Rural Council. While there, I had the opportunity to observe this leader in action. Great communicators are not only good with words, able to express themselves clearly, but they are also excellent listeners. They are able to articulate what is and paint a clear picture of what could be - the possibilities. Since communication is more than words, they are able to combine verbals and non-verbals to help a variety of people understand their message. From the time he stepped to the podium, Chris exuded confidence. His confidence came through loud and clear as he expressed the reason why we were there and how participants could benefit from the information shared. There is a thin line between being confident and arrogant, but you can tell the difference. When you are in the presence of someone with confidence, it tends to breed confidence in others. However, when in the presence of someone who is arrogant, that person tends to leave a negative impression. Arrogance breeds contempt, in the possessor and the observer. A person who is credible "knows his stuff." It does not necessarily means s/he knows the answer to everything, but it does mean s/he will take the necessary steps to get the answer you need. A credible leader also recognizes and relies on the skills and talents resident in his or her team members. 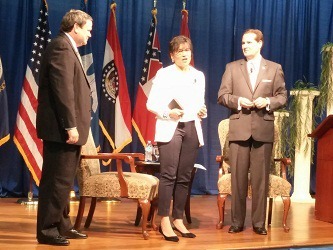 Chris and his team built a meaningful agenda designed to accomplish the goals of the Forum. He expressed sincere appreciation for their input in making the Forum a success. A courageous leader is willing to do the right thing because he believes it is the right thing. He is willing to say and do "the hard thing" simply because it is the right thing to do. And it is always a good time to do the right thing. A courageous leader is willing to tackle the hard problems, even though there are no easy answers. My read on Chris Masingill is that he is a courageous leader who leads. Although "compassionate" may be omitted when some lists traits of a leader, I believe that the leader without it is heartless. A compassionate leader is empathetic, able to communicate with a variety of people, treating each with respect and dignity. Whether interviewing Secretary Penny Pritzker or talking with his staff, Chris was 100% present. He maintained the same respectful demeanor regardless of position. Indeed, Chris Masingill is a leader who leads. This is leadership in action. I hope this gives you a glimpse of leadership in action. Want to know more? Check out another leader who leads.